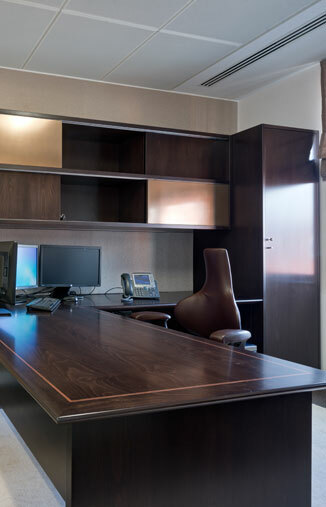 Aprés Furniture have just completed the installation of furniture for Goldentree Asset Management. They have moved into a very prestigious office building at 33 Davies Street, London W1. 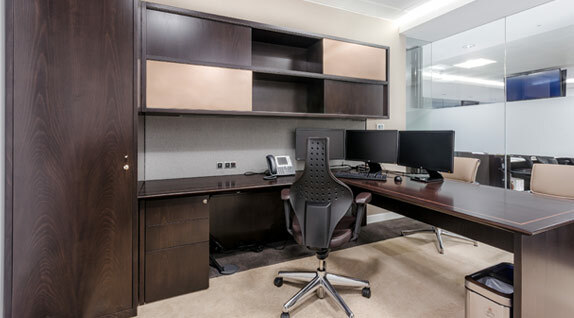 Aprés has a longstanding relationship with Goldentree Asset Management and had worked with the client previously when they moved into the Economist Building in St James in 2004. Having kept in contact and assisted with various changes within their building, Aprés were at the top of their list when it came to choosing a provider for their new offices. Aprés designed a bespoke workwall solution, finished in a dark tinted walnut, for the client's 16 cellular office spaces. This was completed by inlay detail and brass sliding door finishes to the upper part of the workwall. The conference room had a custom-built marble tabletop fitted with inset power and data solutions housed within the box bases. The table was complemented by credenza units in the same finish, complete with refrigeration. The chairs in this room are Eames Soft Pad. "I wanted to thank you guys for all your hard work with the project, the result is fantastic."